I have to say, since the middle of June, it seems like all I've done is battle ants. Every room except the cat's room had them, every single room. The kitchen was the last hold-out but I found them right after the summer solstice. Scrub, scrub scrub. Clean, clean, clean and it didn't seem to make a difference. They would be all over the counter in the morning or when I came home from work. 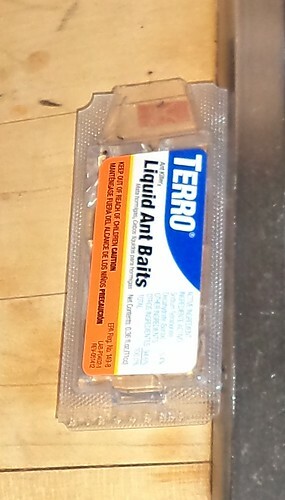 There are two Terro ant traps in the office, two in the bathroom, one in the bedroom and one in the kitchen. I don't remember the last time I had an infestation this bad. Usually, I get a mess of ants in the kitchen from under the sink in early May. It's the little black ones, about an eighth of an inch long. I think we might have referred to them as "sugar" ants when I was growing up. You leave the bowl from breakfast in the sink and by the time you get home from work, they have swarmed that bowl to get at the milk residue. I'm kind of used to them showing up in May and take that as a sign the earth is warming for spring, even if it is gross to have to deal with ants in the sink. But this, this was so much worse. I was in the office getting ready for a raid with my World of Warcraft guild one Saturday night. Part of that includes the reminder that people get a drink and their snacks and "visit the loo", as I put it, so they can sit down for an hour and raid. I took that advice myself and went into the bathroom. There, covering the inside of the frosted glass window, were ants, hundreds and hundreds of ants. Fortunately, I had a Terro bait so I quickly opened it and set it on the sill of the window. When we took our mid-raid break, I checked on it. The swarm had attacked the bait. It was a sea of black bodies around the entrance to the bait. Three days later, there was a line of ants coming out of a small hole in the side of the window (since taped shut until I can find the caulking gun), down the wall, across the back of the tub, down the junction of the tub and the wall and across the bathroom floor to the cat's water dish. Out came another Terro. Once placed, they never went beyond the bait. We've had all this rain. Why would they be coming in and going to the water dish? The problem is that I can't find, around the outside of the house, a large nest. If you disturb an ant's nest, they will move. I've never found cornmeal to be effective. "It swells up inside of them and explodes," is the popular comment. Borax is very effective, but it is highly toxic to people and animals so, although I used to use it a long time ago because it's great as a laundry additive to get whites white, I don't want to worry about the girls. I read, years ago, where if you can find two different nests outside, take a shovel of dirt from each and dump that dirt onto the other nest. Both nests will feel they are being attacked and will move. But that's just it. I can't find nests around the house. Then, in preparation for repainting the top of the front steps, I moved the begonias. There they were, living under the pots. This would be close enough to the bathroom to get into it. I moved the pots to the ground, sprayed the bottom of the pots with flying insect killer as that was all I had, swept off any lingering ants and left the pots overnight on the sidewalk while the paint cured on the front steps. When I put the pots back, there were no ants to be seen. This first week of July hasn't seen any of the small ants in any of the places they were before. I have had some big, half-inch long, ants on the kitchen counter, which bothers me, but the little ones that were a complete infestation seem to be gone. I don't know if this was just because it was a soggy spring and early summer or if there is something else going on here. Did anyone else have problems? 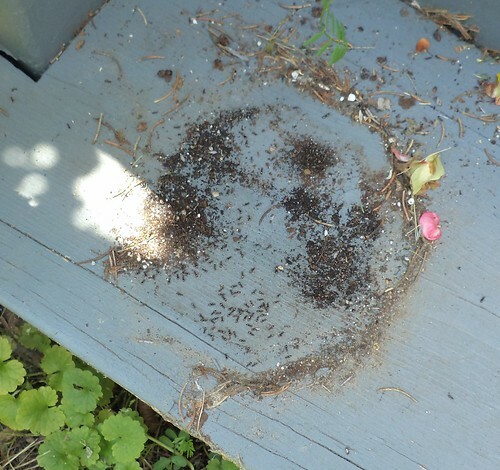 We get ants every spring. The terro works great for bait. If I find a nest I usually circle round it generously with baby powder. I also use baby powder on window sills and such. Ants won't cross it, and it forces them to move the nest.